The monster towers above the city, wreaking havoc on the buildings below. No, its not Godzilla, it your cat! Check out this corrugated cardboard couch saver. 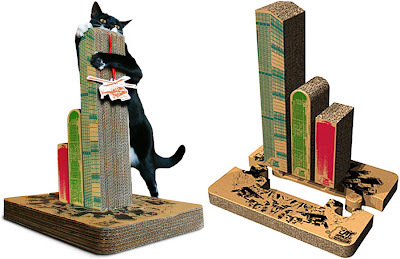 Designed to look like a skyline of city buildings, this stylish kitty scratching post is a must for architectural fans. Not since Godzilla and King Kong has an animal taken out more frustration on tall buildings.